Here is some of the information I recently shared in my July newsletter. Each newsletter has a specific focus. 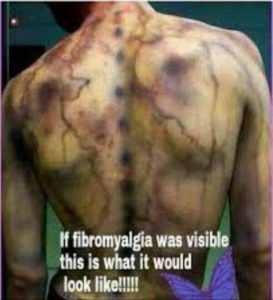 This month is focused on fibromyalgia and Chronic Pain information. If you would be interested in receiving m y newsletters, please head over to my contact page and sign up. 1.Five myths about pain that many manual therapists are sick of Hearing by Nick Ng (can be found in Massage & Fitness Magazine). 2. 3 steps to be an even more effective pain relief therapist by Irene Diamond–a 45 minutes video of a webcast. 1. A study titled”Effectiveness of different styles of massage therapy in fibromyalgia: a systematic review and meta-analysis by Yuan, Matsutani & Marques and publish in Apr 2015 in Man Ther concluded: “myofascial release had large, positive effects on pain and medium effects on anxiety and depression in contrast with placebo…myofascial release also improves fatigue, stiffness and quality of life. Connective tissue massage improves depression and quality of life; manual lymphatic drainage is superior to connective tissue massage regarding depression and quality of life; Shiatsu improves pain, pressure pain threshold, fatigue, sleep and quality of life: and Swedish massage does not improve outcomes. 2. In a study in Sci Rep 2016 titled “Efficacy of cupping therapy in patients with the fibromyalgia syndrome-a randomized placebo-controlled trial” concluded: Five cupping treatments were more effective than usual care to improve pain intensity and quality of life. However, the effects were small and cupping was not superior to sham cupping treatments, further research is warranted. That pain can be conceptualized as a conscious correlate of the implicit perception that tissue is in danger. 4. A short summary of an article by John Quintner, titled “Evolution, Stress, and Fibromyalgia” adapted from Lyon P, Cohen M, Quinter J. An evolutionary stress-response hypothesis for Chronic Widespread Pain (Fibromyalgia Syndrome). Pain Med 2011;12:1167-1178 suggests a Stress Response and Substance P response in combination may explain the disparity in symptoms and why many treatments have not been effective. 5. A follow-up article to the above reference, titled “How did fibromyalgia ever become a brain disease? Disentangling conjecture and truth, by John Quintner, debunks the Central sensitivity syndromes theories. 7. A study titled “Effectiveness of Therapeutic Exercise in Fibromyalgia Syndrome: A Systematic Review and Meta-Analysis of Randomized Clinical Trials“, published in Biomed Res Int 2017, concludes: aerobic and muscle-strengthening exercises are the most effective way of reducing pain and improving global well-being in people with fibromyalgia and that stretching and aerobic exercises increase health-related quality of life. 8. A narrative article, published in Minerva Anestesiol Jan 2018, titled “The role of cannabinoids in pain control: the good, the bad and the ugly” concluded: cannabinoids appear to be most effective in controlling neuropathic pain, allodynia, medication-rebound headache, and chronic non cancer pain, but do not seem to offer any advantage over nonopioid analgesics for acute pain. Cannabinoids seem to work no better than placebo for visceral pain and conferred only modest analgesic effect in cancer pain. 9. A study published in Turk J Med Sci Dec 2017, titled “Does fibromyalgia have an effect on hearing loss in women?” concludes: results point to a pathophysiologic link between fibromyalgia and the development of audiological abnormalities in these patients.